A lovely show by any accounts, but somewhat disappointing compared to previous years. A cold spring might have hindered the growth of some of the plants this year, but the biggest impact was the political climate hitting many of the traditional garden sponsors, resulting in a somewhat muted show. 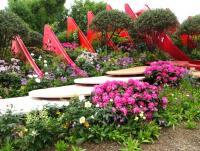 An interesting show this year at the RHS Chelsea Flower Show, with only 8 large show gardens compared the normal 15 or so. On the plus side however it did free up green spaces to relax and take in the atmosphere. 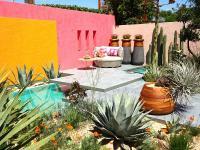 Hard landscaping trends in many of the gardens this year were textured walls, angular paving and copper adornments. Plant-wise, many different types of umbels were featured with their showy flower heads, pines were displayed in varying ways and Thrifts, Ragged Robin, Iris’, Hostas and Lupins all seemed popular in the inspirational show gardens. The Main Avenue certainly wasn’t the highlight that it used to be, but The BBC Radio 2 Feel Good Gardens (a last minute inclusion to the show) were a welcome addition and proved very popular. BBC Radio 2 presenters were paired up with professional garden designers to showcase gardens that collectively represented our five senses. Measuring only ten metres square, they were fun, colourful and full of ideas, many of which you could take home and transform into your own garden. Having a passion for growing vegetables my favourite was The Chris Evans Taste Garden, which showcased the tastiest plants grown in UK gardens and allotments. A lovely display to excite and stimulate the palate. The Zoe Ball Listening Garden (pictured right) was also very interesting; music played beneath the ground, with surface water in three troughs responding to the music, creating patterns on the surface making it mesmerising to watch. Out of the few show gardens on display, two really stood out; The Morgan Stanley Garden (which won a Silver Gilt medal) and The Silk Road Garden, Chengdu, China (which also won a Silver Gilt medal). The later featured an amazing sculptured centrepiece (pictured right), brilliantly using the space on an awkwardly shaped triangular plot. Water features magically disappeared into gravel and swathes of gorgeous flower beds featured Peonies, Poppies, Rhododendrons and Primulas on one side of the garden. The garden's opposite side contrasted this planting scheme with Spindles, Loropetalums, Trachelospermums and grasses. Six of the nine Artisan gardens scooped Gold medals this year, with each one highlighting craftsmanship and artisanal skills on these delightful small plots.The colourful Gold-medal winning Gosho No Niwa (No Wall, No War) Garden with vibrant Maples, Pines, Bonsai Conifers and moss covered rocks all helped to create a sense of peace in this open garden containing beauty and history. With two Gold, two Silver-Gilt and one Bronze medal winning Fresh Gardens this year, the five Fresh gardens were vastly different from the other garden categories; full of imagination, innovation and definitely thought provoking. The Inland Homes: Beneath a Mexican Sky Garden (pictured right), which won a Silver-Gilt medal, was a courtyard garden with dramatic clementine, coral and cappuccino colour-washed walls. A dynamic planting scheme of drought tolerant plants that merged a Mediterranean style with country cottage planting. Its pool, with floating steps, created a calming ambience. Bright, colourful, full of variety and incredibly vibrant in the full sun with its strong colours. 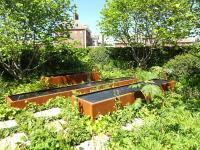 This garden highlighted the RHS' call to action to transform the grey, unloved spaces in our urban environment into beautiful spaces to foster our well-being and to improve the environment and encourage wildlife. Plants brighten up our streets and enhance our lives, building stronger, healthier and happier communities. Every inch of space was used to its full potential in this garden and the RHS want your support in joining thousands of people who have promised to plant up an area of grey to green. This is the heart of RHS Chelsea Flower Show and is a magnet for all garden enthusiasts. A floral paradise with educational and scientific exhibits, exquisite displays showcasing the importance of specialist nurseries all with friendly and passionate representatives on hand to answer those burning questions you may have. The RHS Chelsea Plant of the Year 2017 was won by the dwarf Mulberry ‘Charlotte Russe’. Many years in the making by its 89-year-old breeder Hajime Matsunaga. An odd and somewhat muted year for Chelsea this year as the uncertainties of the political climate hit many of the traditional garden sponsors. Maybe smaller, more cost effective gardens like the artisan and themed small gardens, which we can relate to more in our own ‘green spaces’, is the way forward for Chelsea? Who knows what we’ll see next year? Hopefully it’s a little fuller of inspiration, creativity and wow factor in 2018! There was definitely a sense of space and emptiness in parts of the showground this year, however still a lovely show to and a tribute to the enormous amount of work, effort, sweat, dedication, stress and worry put in to create the prestigious RHS Chelsea Flower Show by all involved. Published on 01 Jun 2017 and Filed under Reviews.